J. M. Barrie was a Scottish dramatist and writer. When he was a young man he wanted to be a writer, however his family was against it and wanted him to pursue something more serious, such as the ministry. They reached an agreement and he entered the University of Edinburgh to study literature. After moving to London he began writing novels and plays. In 1897 he met the Llewelyn Davies family. The boys, 5 of them, were inspirations for the characters in Peter Pan. He would go for walks in Kensington Gardens and while there he would amuse the boys with stories. The youngest was named Peter, who at the time was a baby. Barrie would tell his older brothers, George and Jack that Peter could fly and that before a baby was born it was a bird. He continued by saying that the windows in nurseries had bars on them so the babies wouldn’t fly away. His most beloved story is about a baby who actually did fly out the window. When the parents of the boys died, Barrie became their guardian. Peter Pan first appeared in The Little White Bird. It was published in the United States and then in Britain in 1902. 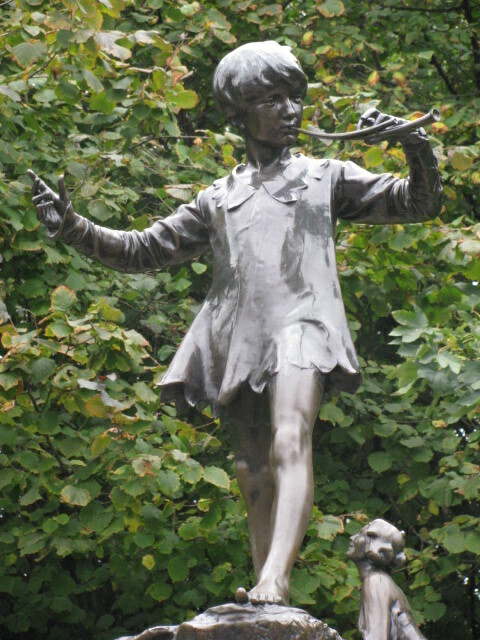 Peter Pan, or The Boy Who Wouldn’t Grow Up, first appeared on stage in 1904. 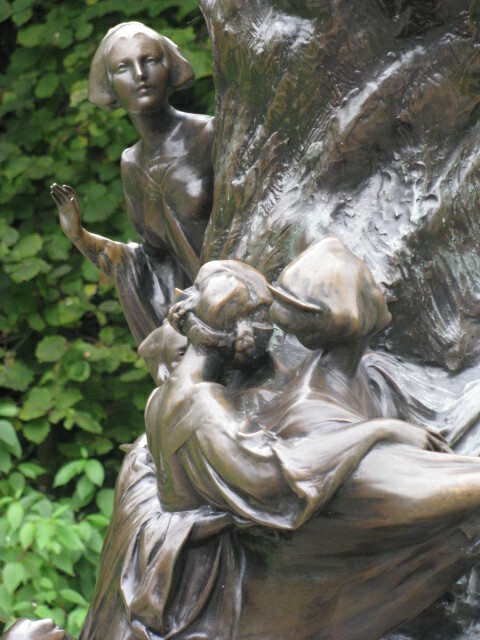 In 1911, Barrie developed the play into a novel, Peter and Wendy. 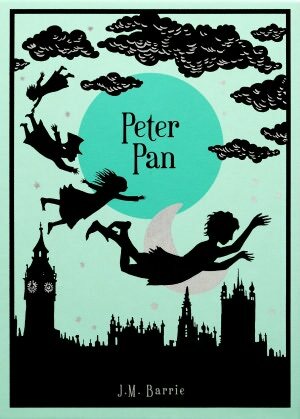 In 1929, Barrie gave the children’s hospital, Great Ormond Street Hospital in London the rights of all the Peter Pan works. The hospital still benefits. Even though Barrie continued to write after his success with Peter Pan, this work eclipsed all of his other works. The story is a wonderful tale about a little boy named Peter who refuses to grow up. He flies off to Neverland and has adventures with his band of Lost Boys. There are pirates and the Indian princess Tiger Lily. One night while sitting outside the Darling’s house to listen to the mother tell a bedtime story, Peter is spied and during his escape he loses his shadow. When he goes back for it, Wendy, the daughter hears him and is able to reattach Peter’s shadow. Peter finds out that Wendy remembers many bedtime stories and asks her to go to Neverland to be a mother to the Lost Boys. The Darling siblings, Wendy, John, and Michael join Peter Pan and the Lost Boys in Neverland. 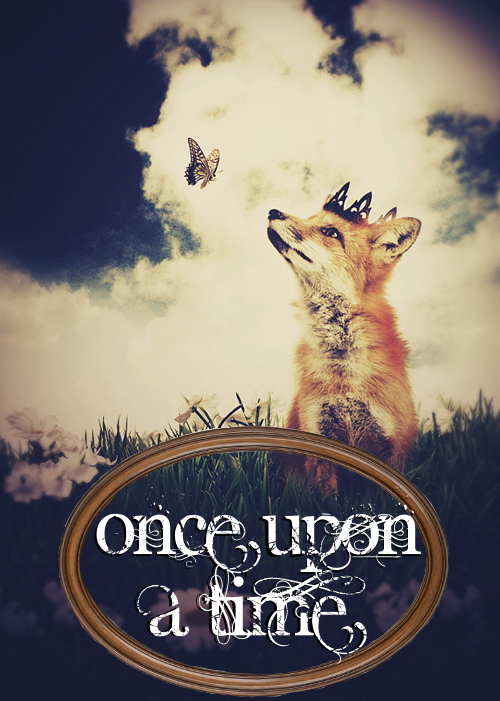 I read this novel for the Once Upon a Time challenge hosted by Carl. I picked up a copy almost six months ago and I’ve been saving it for this challenge. And I have to say, it was worth the wait. This is not a children’s story in my opinion. Kids will like the novel, however, I feel that this is intended for adults. It reminds me a lot of Looney Tunes. Yes I loved the cartoons as a child. However, it wasn’t until I was an adult did I really get the humor. His satire and phrases made me giggle on many occasions. 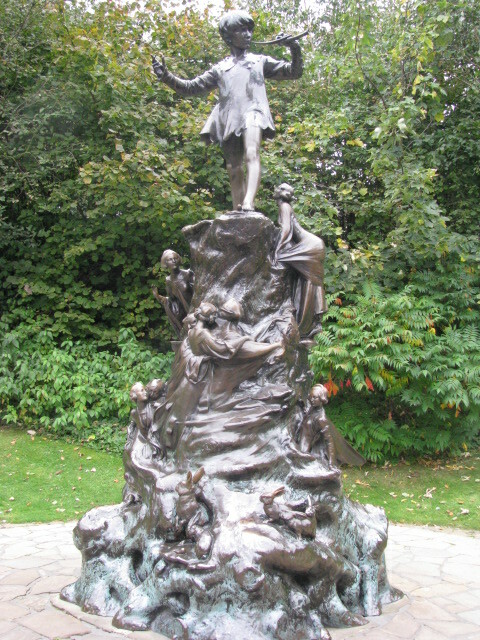 In Kensington Gardens there is a statue to commemorate Barrie’s inspiration for Peter Pan. The sculptor, Sir George Frampton didn’t use photos of the Llewelyn boys instead he worked with a child model. Barrie didn’t like the end result since he said it “doesn’t show the devil in Peter.” I know Barrie was disappointed in it, but I got a kick out of seeing it. This entry was posted in Books and tagged Fantasy Novels, J. M. Barrie, Kensington Gardens, Llewelyn Davies family, Once Upon A Time, Peter Pan, Reading Challenges, Scotland, Scottish Authors, Scottish Writers, Sir George Frampton. Bookmark the permalink. You have shared a lot of interesting background about Barrie and the book. And I love the photos of the statue–I have not seen it before. Thank you! It was fun to see the statue. London is full of great things to see and slowly I am visiting all of the sites. Thanks! I haven’t read it yet but I loved the movie about Barrie, Finding Neverland, with Johnny Depp. So nice. I love the story and really think I should read it. That’s a wonderful sculpture. The qoutes are great as well. I want to rewatch Finding Neverland. I’m a huge fan of Depp and after reading this I think it will be even better. The story is much better than I thought it would be. He has such a way of words and making you think. Fascinating post—-having never read this book and having seen the movie I was happy to hear all of the little facts you had about the author!! Thanks! I love learning those tidbits. I think it is the history nerd in me. And it helps when I play trivia! Why can’t you fly now, mother? Because I am grown up, dearest. When people grow up they forget the way. Why do they forget the way? Those are good too! This story has so many. I really enjoyed his writing style. Great post! What else can I possibly say? I can recall when Peter Pan was TV hit during my youth. Thanks for sharing the background that I didn’t know. Any good children’s book isn’t written strictly for children: it is written for everyone. But you’re right, when we read the books we loved as children when we are adults they become new stories because they take on new meanings. As a child, we’re able to relate to Peter Pan for more superficial reasons: the fairy tale and adventure aspects of the book. But when we revisit Peter when we’re older, we find that the book is about forgetting our younger selves and how important it is to hold onto them. Nice Post! Have you seen Finding Neverland? Another Peter Pan movie I suggest is Hook by Steven Spielberg: it’s about a Peter Pan who left Neverland and completely forgot the boy he used to be. He becomes a Peter Pan who fears death. I’ve seen both Finding Neverland and Hook and I enjoyed both of them. Hook was on TV recently and I want to track down a copy of Finding Neverland. This story has a great way of reminding me not to forget what it is like to be a child and to keep it close to me. Just like The Little Prince, I felt like a kid again and wanted to stay that way. It is so hard not to think like an adult, but it is good to remind ourselves not to be so serious all of the time. Thanks for the comment. Great review! Very inspiring! Now I need to read this with my daughter! I hope both of you enjoy! Yes, Finding Neverland is a lovely movie, though sad. You’ve made me want to read the book! The movie is sad…I need to prepare myself when I watch it again. Mr. Barrie was certainly generous to forfeit his rights to his wonderful book to such a great cause. I was unaware of the story behind Peter Pan until I read your post. Great share…fun and informative. I know my children loved Peter Pan growning up, as I did when I was a child. It’s refreshing to know, that in addition to a marvelous story, many people have benefited from the writing through Mr. Barrie’s generosity. Thanks! I loved the bit about giving the rights to the hospital. And they still benefit, which is fantastic. I can see why many children love the story. I wish I read it when I was younger and then as an adult. That’s a beautiful statue! Great post! I should probably read the original Peter Pan one day. I loved seeing the statue. I feel horrible that he didn’t like it, but it brought me a lot of joy and I think countless others. It is full of magic!!! I hope you enjoy it again. Just found it for free on the internet – transferring it to my ebook reader now. Yay!! That’s great. Enjoy the magic! Thank you for the interesting history about Peter Pan. I remember reading it as a child! I found the facts interesting…glad you enjoyed them as well. It is a fun story…very charming. It is excellent. I actually read it before I saw Finding Neverland in the theater when it came out and it added so much to the experience for me. Thanks Carl! I’ll have to check it out. And I have a feeling I will be watching Finding Neverland again real soon. I read Barrie’s biography and read “Neverland”… when you learn of Barrie and his true involvement with the Davies family and the children you get a different view of the story of Peter Pan…he was also involved in Daphne du Maurier…. strange man. Mostly I remember seeing parts of Peter Pan that was put on broadway starring Mary Martin (yes a woman!) and it was fabulous! I haven’t looked too much into the whole story. From the pieces I’ve gleamed, he does sound interesting to say the least. And I’ve heard about Mary Martin and her performance. Thank you for all the wonderful information on Barrie and Peter Pan! Had no idea about much of the trivia! I didn’t know until I looked up some of it. Granted I only scratched the surface and I’m sure there is much more to learn. Peter Pan is one of my favorite books, largely for Barrie’s wonderful writing–he’s such a charming narrator, and you pulled out such beautiful quotes! 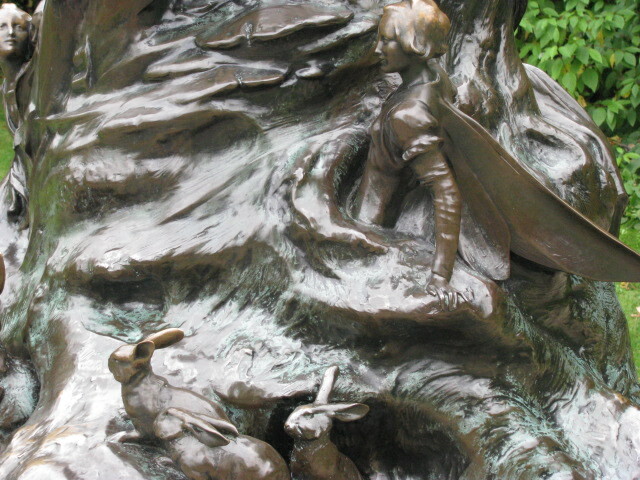 I love the Peter Pan statue too, especially the base–the more I stare at it, the more I see in it. I wish I had more time to enjoy the statue, but there were so many people trying to get photos and I didn’t want to be rude. And yes, he is a charming narrator. I loved it. I love the story and I love the play. Children books teach adults things we don’t see anymore. It is a classic reading for everyone. They really do remind me of the important things in life…I should read more to stay balanced in life. It was exciting for me to see the statue. Experiencing the literary culture was a huge draw for my moving here. Thanks Zelmare! Loved this blog — and gave it a Bean’s Pat on my blog today. Thanks for sharing. Thanks Pat…I’ll pop on over and check it out. I actually didn’t like the novel. I much prefer the movie version. Is there a certain movie version? The Disney one maybe? Thanks Myra…it is exciting to be here in London and to be able to share the photos. I didn’t know much about Peter Pan before I started this project but I ended up liking it more knowing the story behind it. I didn’t delve too much into Barrie’s past…he seems a wee bit odd and I would like to know more. I’ve never considered reading this book, probably because I’ve seen so many different versions of the film – it goes against my rules about reading the book first. Perhaps I should make an exception. Against your rules about reading a book first–that made me chuckle. I was surprised by how much I enjoyed reading this one. You might as well, if you can bend the rule a little 🙂 Thanks Lynn!